BERLIN/PRNewswire/ — Varian Medical Systems (NYSE: VAR) is spotlighting its new Halcyon™ radiotherapy treatment system at the 2017 meeting of DEGRO, the German radiation oncology society, which took place in Berlin from June 15th-18th. In addition to this new treatment device, Varian has also exhibit its full range of solutions for radiotherapy, radiosurgery, brachytherapy, and proton therapy. Engineered to revolutionize clinical workflow, the Halcyon system simplifies and enhances virtually every aspect of image-guided volumetric intensity modulated radiotherapy (IMRT) for advanced cancer treatments. The driving focus of the human-centered, user-friendly design of Halcyon was to automate, streamline and simplify virtually every aspect of treatment. The result is an advanced system that is more comfortable for the patient while delivering ease of use for healthcare providers, accelerated installation timeframes, expedited commissioning, simplified training, and automated treatment. Halcyon is well suited to handle the majority of cancer patients, offering treatments for prostate, breast, head & neck, and many other forms of cancer. For more information on Halcyon visit www.varian.com/halcyon. Also on display at the Varian booth was the company’s TrueBeam® platform for radiotherapy and radiosurgery, along with the RapidArc® image-guided intensity-modulated radiotherapy system, as well as Varian’s range of advanced brachytherapy software and hardware. Visitors were able to learn more about the company’s new HyperArc™* high-definition radiotherapy system, which exploits specific capabilities of the TrueBeam® and Edge™ platforms and is designed to deliver more compact radiation doses that may fully saturate a targeted tumor and “fall off” sharply outside the target zone, potentially minimizing dose to specific organs requiring more protection. 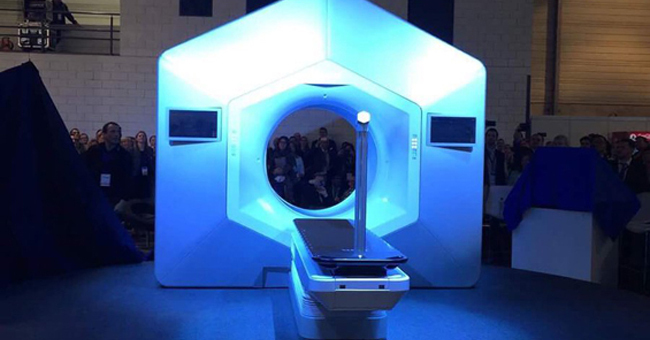 Additionally, spotlight of the Varian booth was the company’s ProBeam® system, a fully-integrated image-guided IMPT (intensity-modulated proton therapy) solution, which incorporates pencil-beam scanning technology to optimize the dose applied to every point within the area being treated. ProBeam has been selected to equip multiple proton therapy centers around the world, including several in Europe. On Friday June 16th, Varian has hosted a lunch symposium at DEGRO discussing the challenges and opportunities of innovation in radiotherapy, with a second symposium in the evening that was focused on Varian’s RapidPlan™ knowledge-based planning software. Varian Medical Systems focuses energy on saving lives and is the world’s leading manufacturer of medical devices and software for treating and managing cancer. Headquartered in Palo Alto, California, Varian employs approximately 6,400 people around the world. For more information, visit http://www.varian.com.